This entry was posted on February 6, 2014 by Chillbrook. 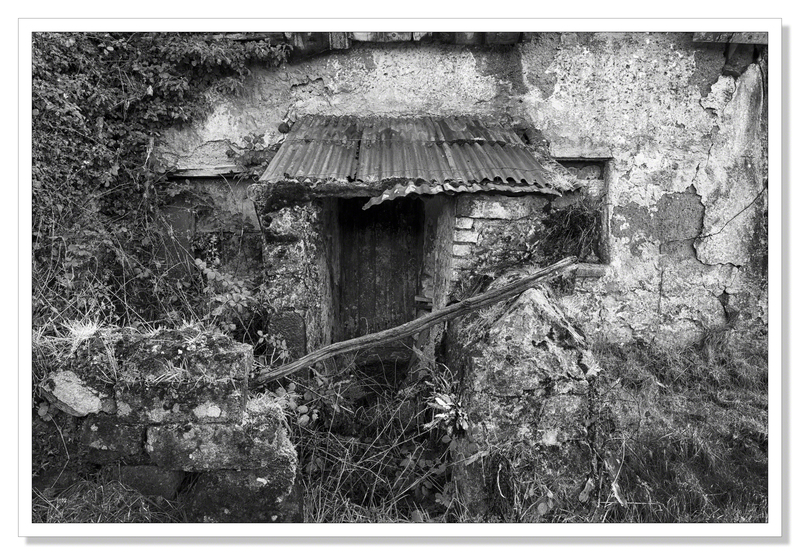 It was filed under Photography and was tagged with Black and White photography, Cornwall, Cornwall Photographic, Cornwall Photography, Cottage, Countryside, English Countryside, Landscape, Landscape Photography, Nikon D800, photographs of Cornwall, Photography, tumbledown. Wow! It really needs a lot of TLC, doesn’t it? I’m sure people must have been much shorter in the ‘olden days’, because most old cottages that I’ve been in, have very low ceilings and doorways. Of course, this doesn’t apply to the wealthy, who had huge homes with high ceilings and vast doorways. I guess they had more food to make them grow taller, and wider. :) Fabulous B&w images, Adrian. Small openings are easy to defend, and have the added benefit of discouraging visitors. An interesting cottage for sure.Make you wonder about the history of it and any previous occupants. Thanks for your comment Nathan. It would be interesting to find out the history of the cottage. I would imagine it would have been a farm workers cottage. There were others close by of similar size that have been renovated. I would have to agree with you on the power lines Vivian but when I look at them, I have to shrug and accept I use electricity. It’s just a shame the cables aren’t buried in the ground rather than carried overhead but of course, it costs a bit more to do it that way so power companies don’t unless forced to which they have been in some parts of the country. We have the same issues here in the U.S. 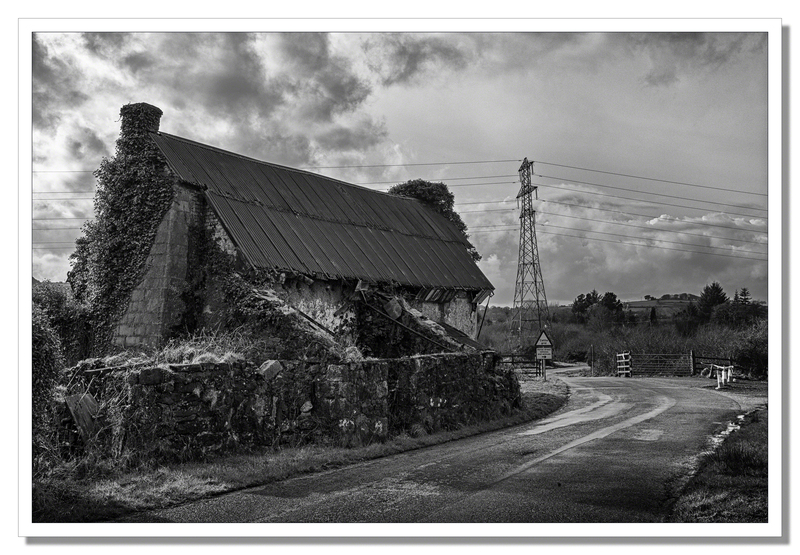 So many times I’ve gone to frame a shot and been unable to eliminate power lines, from any angle! It is so disappointing that the power companies aren’t willing to invest in burying the lines. They define and far too often dominate our landscapes. Les deux photos son tres belle! That doorway image is priceless! Thank you Phil. Much appreciated! Very nice. This sets your mind at ease…. Pylons are a pain aren’t they? …. I’m sure when they’re installed that quite some time is taken to find the worst possible position from a photographic point of view! Thank you Noeline. It certainly seems that way. You can see a nice shot only what would be a beautiful view is obscured by the pylons and there is no way to get around them. In the national parks, the lines are buried but not here unfortunately. Very nice images! Looks like it was a beautiful drive! Thank you Robyn! Yes it was, a beautiful drive. That’s a very nice find and looks good in black and white. I’ve seen similar buildings in my time in Germany…they add such a richness to the local environment, even if it’s somewhat marred by those pylons…. Love the 2nd shot…get out into the less traveled areas is great, and you do a great job capturing the mood (the B&W is great). Thanks Randall. I try and get round the back lanes when I can. The lanes do have a tendency to get very steep and very narrow in places where there is often no turning back. All part of the fun although perhaps pointing towards a cliff edge at a 45° angle praying the brakes won’t give out perhaps not so. ;-)I don’t use black and white so much but for this shot, it definitely seemed to suit. Absolutely beautiful. We have those kind of cottages here in Sweden as well, but not many left. I think the small entrance is typical. People in those days were not as tall as we are, and to stay warm they usually had small windows and tiny doors too. No big openings to wind and cold. A very long time ago I guess one of the reasons could be defence as well. Yes, it’s a pity we will never get the story behind it.